Be ready for midday pickup at your San José hotel, and climb onboard an air-conditioned minivan to meet your driver and guide for the afternoon. Begin with a scenic drive through La Sabana Metropolitan Park, the largest urban park in Costa Rica and a popular recreation spot for city dwellers. See the modern homes and shops of the nearby Rohrmoser neighborhood before taking in some of the capital’s grandest architecture with a stroll along the Paseo Colón. 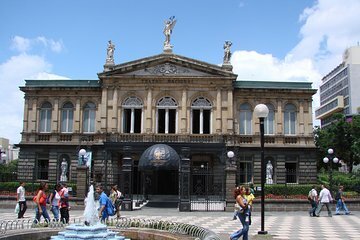 Admire one of San José’s cultural jewels with a guided tour of the National Theater (admission included) before digging into the country’s glittering past with an included visit to the Pre-Columbian Gold Museum at the Plaza de la Cultura. Continue with a leisurely walk through the Plaza de la Democracia and along the Boulevard Circuito Judicial, where you can see the Supreme Court of Justice, before hopping back on board the minivan. Relax and take in the sights from your seat as you cruise by landmarks including the National Library, Casa Amarilla, the National Park, and the Electoral Supreme Court. See a slice of life in old San José with a circuit through the historic neighborhoods of Otoya, Amón, and Toumón. Disembark to sip a cup of Costa Rican coffee (own expense) and admire the work of local artists at a diamond and emerald jewelry gallery. Learn the backstory behind the gold and precious gemstones used with an educational video before relaxing on the ride back to your hotel. I've taken many tours and it is always difficult to pinpoint why I was not thoroughly impressed with a tour. I am not sure if it was the guide, the city, or the tour agenda. This was one of those occasions. We visited a central park that had a great deal of public art, a church that unfortunately was closed, the Central Theater, the Gold Museum, and then a local workshop. My favorite part of this tour was the Central Theater and the bits of art that we saw at the other locations. It was unfortunate that we did not get to see the church and the final stop was not at all necessary.